This post is a total brain dump so be prepared for more obsessing than I usually let through on here! Also please excuse any incoherence – it’s been a busy few days. While eating breakfast on Wednesday morning, I received an email from our landlord informing us that she and her husband are moving back to the area and asking if we planned to move out by the end of our lease on August 25. No, we were not planning to move out! We would have liked to stay in this townhouse until leaving Durham entirely. Our lease has an automatic renewal clause, so we thought we were OK in not being proactive with our property management company regarding renewing. I immediately yelled for Kyle, who was getting in the shower, told him that we had to move in a month, burst into tears and fell on the floor (can you tell I REALLY hate having my plans changed or not having plans?) and within 3 minutes we were rereading the email, checking our lease, and on to perusing padmapper.com. Our landlord said in her email that if we needed more time to move she could be “flexible” for about a month – our lease stipulates that we must receive (and give) 60 days notice about moving out, so we legally can take until the end of September if necessary. Since prime moving season in this college town winds down in August, though, it might be easier for us to jump ship sooner. I’m trying to think of this inconvenience as an opportunity. While we truly love our current townhouse and it is perfect for us right now, it’s not ideal for a roommate situation as the second bedroom is quite small. A year ago we were willing to say “worry about later later” regarding Kyle moving out and me finding a roommate, but now we’re a year closer to that coming to pass and we can search for a place that better suits our changing needs. However, our first reactions to what size of a place were disparate – Kyle thinks we should get a 1BR and I think we should get a 3BR! His logic is that we have more space than we need right now so it’s time to downsize. While he’s still living here we can save more money for when we’re living apart and have to travel to see one another and after he moves I can continue to live there by myself. My logic is that the bigger a place we get the lower the cost per person is; we should go ahead and secure one roommate now and another when Kyle leaves. I quickly looked up some prices and square footages for a complex that we were interested in when we were searching for a new place last summer. I’ve never priced out 1 BRs before and I wanted to see how they compare with 2 and 3 BRs. I looked at one location of this one complex because I wanted to sort of control for location, build quality, and amenities. Note: These prices are on the low side for Durham given the size and location of the units (and hence there is usually a long waiting list to get in). This is kind of a classic price vs. value issue – the price total cost is least for the 1 BR but the price per square foot is least for the 3 BR. It makes my brain hurt – I can’t settle on either one or split the difference for the 2 BR. 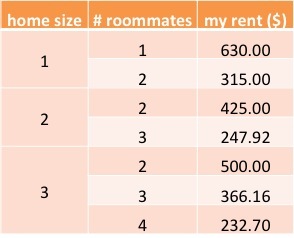 Using the formula I provided for calculating rent among roommates and from studying the floor plan dimensions provided by the complex, I figured out how much “my” rent would be in each of the sizes of units with different numbers of occupants. I think it’s a bit easier to understand the differences among the values in graphical form. These plots further entrench for me the difficulty in deciding what would be best to do rent-wise! 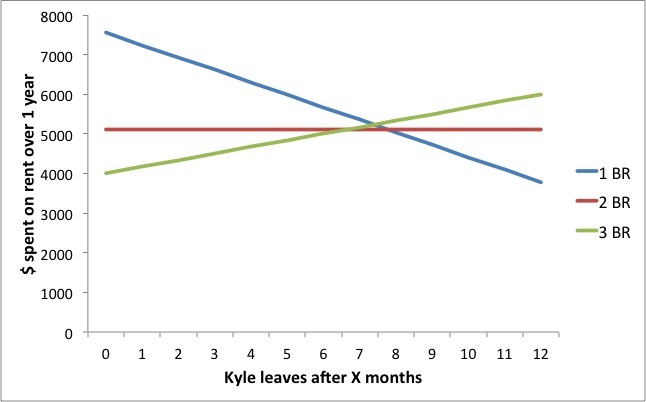 Living with Kyle in a 1 BR would be fairly inexpensive, but it would become the most expensive option when he leaves. Cramming into a 3 BR with two roommates is the cheapest possible configuration , but with just the two of us there it’s the most expensive after living alone. What size place is actually the lowest price or the best value will depend on how long Kyle is in town for. He hasn’t set a graduation date or applied for jobs. While I am still optimistic that he could be moving on to his next job in the fall, even early fall, I also have to admit that there is a possibility that he could be here for the full year – just because we don’t know the future. So I played with some numbers of different scenarios on what we would pay in total in rent over the next year. The x axis is the number of months after we move in until Kyle moves out and the y axis is the rent we would pay for “my” share of the rent over 1 year. Only my share of the rent is reflected because, while we would know what Kyle’s share would be in Durham, we can’t account for what he would be paying elsewhere after he moves. These calcs assume we don’t have a roommate while Kyle is in town as that is his preference. I find it interesting that for this particular company, all the options equal out in total rent if Kyle is here for about 7 months after we move. Getting a 2 BR is the safe option as it would be easy to budget the same rent the whole year, first with Kyle here and then with one roommate. If we think Kyle is going to leave sooner than 7 months, the 3 BR would make the most sense, but if he’s going to take longer we should go for the 1 BR. But we don’t know! 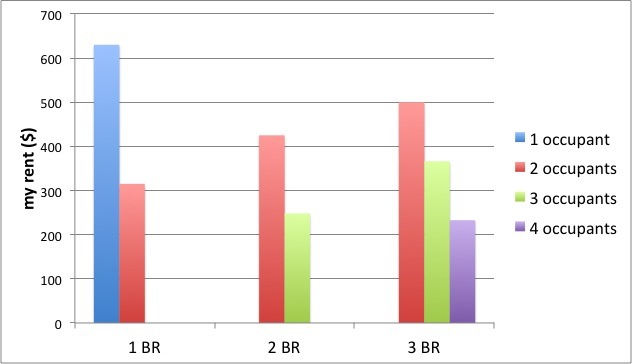 Anyway the numbers above are only a little case study of how 1, 2, and 3 BR places compare. And it leaves me more confused than when I started! Kyle and I are still talking through what we want out of our next place – we haven’t had much time alone together in the past couple days so we’ve had a lot of disjointed gchat conversations. As I said, I initially wanted to go for a larger place for a potentially lower rent and Kyle wanted to go for a 1 BR. I don’t really want to live alone after Kyle moves so the 1 BR isn’t very attractive. Then again, finding roommates is a process and definitely introduces an element of uncertainty. Kyle is pretty adamant that he doesn’t want a roommate while we’re still living together, which I can appreciate, and now that we’re fairly sure that he won’t be involuntarily unemployed. Last summer we made a list of what we liked and didn’t like about our then-apartment. Now that we have lived in another place together we can add to the list of what we appreciate in an abode. (Chiefly, we love our current location with a short commute to school.) The main reason we didn’t consider a 1 BR last time around is that we love to entertain and we’ve observed that the 1 BR layouts available in this area come with not just fewer bedrooms but also a smaller common area. If we could find a 1 BR with a good layout for the common area, it would be an attractive option. In addition to Kyle preferring not to have roommates, I’ve gotten indications from talking with friends that we might be more undesirable as roommates than I had anticipated. I mean, I get that anyone would want to be cautious about living with a married couple because of the relationship dynamics. But my friends indicated that a roommate might feel like she was moving into a space dominated by the other couple instead of like a full housemate – even if we were renting as well and had only recently moved in. It doesn’t help that we wouldn’t be able to tell the roommate exactly when Kyle would be moving out! It’s all so much to think about! And unexpectedly, too. I’m feeling pressure to make a decision quickly so that we can get on a waiting list for a complex. Have you ever been told to move out when you didn’t want to? Do you tend to look more at price or value? What are you highest priorities when you are choosing a new place to live? Would you ever consider living with a married couple if one was moving out soon? 36 Responses to "Choosing a Home Size"
So after Kyle moves, will you be ABD and be in dissertation writing mode yourself? If so, have you thought about how that plays a role into the possible unknowns of a roommate? Since it’s a pretty stressful time on its own, it would seem fairly risky to want to take on an unknown roommate for that time. I think going into it knowing who your roommate would be (and having known them and their habits for a while) might be different. Mrs. Pop @ Planting Our Pennies recently posted..Does Anyone Care About YOUR Money As Much As YOU Do? Maybe I have a bit of a mistaken view of the term ABD, but I think hardly anyone in the sciences/engineering is truly ABD for any time at all. Many people run experiments still while they are writing up their dissertations or even after their defenses! We are both ABD in the sense that we are PhD candidates so there are no formal hoops left aside from the dissertation and the defense. Kyle is veeeery close to being done with experiments (I think) and may even complete them before starting to write up, which is his preference, but I have a LOT of experimental work left to do before I tackle the dissertation. That said, writing should only take a few months on average and can certainly be hurried by an impending defense date. You do have a good point about dealing with a roommate and being a good roommate during what I anticipate to be a few intense, stressful months for each of us (at different times). I know when I was preparing for my prelim I let my household chores and cooking slide quite a bit, which I wouldn’t have the option to do if I had a roommate other than Kyle. And like you said we’re not even guaranteed to have a good or easy roommate and that could add stress. Maybe it would be best for me to be alone when I’m trying to finish up so I can keep a crazy schedule without bothering anyone! I didn’t mention studios (I sort of lump them in with 1BRs) I guess because 1) the particular complex that I pulled the rents and floor plans from doesn’t offer them and 2) I haven’t seen too many available in our area. I’ve just barely started including 1 BR places in my searching so another local person can correct me, but I just don’t think it’s a popular layout here. The ones I have seen are actually more expensive than 1BRs because they tend to be in the hipper parts of the downtown area or very close to the university. I also think that if we got a studio we would never have guests over because it would be a hopeless cause to have everything cleaned up and put away! But maybe entertaining isn’t going to be an option for us much in our next place because of the work demands we’ll have (Kyle has already started insisting that I let him withdraw socially so he can work). Anyway thanks for you great comment – lots of food for thought! The point is definitely to WORK WORK WORK FAST FAST FAST after Kyle leaves so I can get out of here, too! When I was looking at places with my current roommate, we were looking at 2BR vs 3BR. It turns out that for most places, 3BR are the same or not much more per month ($50-$75 extra per person), but have a lot more flexibility. As it turns out, our current place actually rents at the same price as 2BR places. I guess what I’m saying is don’t limit your searches to 2BR places if that’s what you decide to go for – there are a lot of hidden gems in 3BR places! They would not have shown up if we had narrowed our search. The 3BR with 2 people offers a lot of flexibility and I think helps the roommate relationship. If either one of us has guests, they are able to have their own space and not be in the roommate’s way. We also can choose to have short term people coming through ( like for a month at a time – residents, etc…). It’s also much easier to work around one other person, particularly if Kyle will be coming back to visit occasionally. Yes, that small price difference between 2 BRs and 3 BRs is definitely what’s urging me to keep an eye on them. 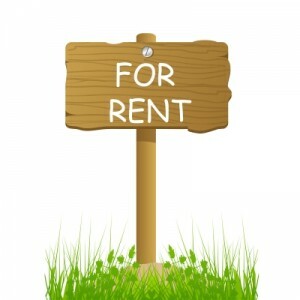 It’s pretty easy to find a 3 BR/ 2 BA house to rent for a reasonable price. The flexibility of having the 3 BR occurred to me as well (I guess that didn’t make it into my ramble…), like you said for being able to take on shorter-term roommates or guests. If we can afford one by ourselves we won’t be pressured to have a roommate but only get one if we want. It would be AMAZING if Kyle had a computational postdoc that was flexible enough that he could spend serious time in Durham, but that’s not what he ideally wants out of a postdoc. We’ll see! Sorry that you guys have to make such an unexpected decision. I would probably be hesitant to move in with a married couple, unless it was more like a detached property. It does seem to me like the 2BR is not only the safest choice, but is the best compromise between all the different things you guys want. If we were looking for a new place, location would be a huge factor. I would want to be much closer to work. You’re right about the 2 BR but I don’t want to hear it!! Yikes! I’ve never experienced being kicked out necessarily, though the first place I rented the landlord decided to convert our two bedroom basement suite into a four bedroom and make us find the new tenants! It was ridiculous so we got the hell out of there. That is a huge disruption – as much as having to move! I would definitely have moved rather than deal with all that. I would probably only live with a married couple if we were all reasonably good friends. I would probably go with the 2BR if I were you guys. The apartment I thought was going to be my last before buying a condo raised my rent about $300/month as I was moving out. That was pretty frustrating, but moving ended up with my rent being about the same anywhere else. I agree with you about being friends first. I was OK with living with a stranger/new friend when I was single, but I think with our situation it would be much easier going in for us to know the roommate somewhat and the roommate to know us as well. And actually a bunch of our friends have moved this summer and were searching for roommates, but they’ve all gotten their leases signed by now so we missed our window to discuss living together (not that I think they necessarily would have wanted to)! That is a huge increase! Wow, that is stressful having to move out! At least they’re giving notice. I’m curious with your budgeting thing… would you charge rent based on occupants or based on square footage of private space? When I first met my fiancee, his apartment rent was being split equally 3 ways, even though one person had a room that was almost the size of the other two rooms combined. If you got a 3-bedroom and you guys rented out the other two rooms, would you split the rent 4 ways equally or split it three ways since you’re only taking one room? I always wonder these things with rent splitting. Obviously, bills would be split equally but I’m more on the square footage ratio splitting than by people and/or rooms splitting. Tara recently posted..You want it? Buy it…. I think that’s the most fair because sharing one bedroom really isn’t the same as having your own, but the people sharing the room are also using disproportionately more of the common area like the kitchen (relative to the number of bedrooms). It would account for the situation your fiance was in and if some people have their own bathrooms and so forth, IMO. However if you read the comments from the post most people think that is overkill and rent should be split equally, usually, or by number of occupants, or perhaps by bidding. I can’t wrap my head around how that is fair, though! I used the formula above for estimating the rents in this post. However, it’s not perfectly implemented here because it’s super difficult to get proper square footages off floorplans, which usually don’t have full dimensions. If you go around measuring rooms and closets and such, which you would have to do to use the formula properly, your roommates will probably think you’re crazy and not want to live with you! So I think you have to get back to estimating and fudging a bit anyway. But I haven’t actually had to carry out any of these ideas so I don’t know how a potential roommate IRL would react to the reasoning! From a financial perspective, I would go with the one bedroom. 7 months appears to be the point where everything is equivalent. No interview process is going to happen over the course of anything less than 3 months. There’ll be a phone interview, and an in person interview, and then some waiting, and finally an offer. Tack on another month for packing and moving and you’re up to 4 months. And that assumes that Kyle gets his first telephone interivew today for the job he eventually takes. More realistically, he’ll spend a few months just sending out CVs and getting rejected and maybe doing some rejecting. The likelihood of the interview process taking 7 months is pretty high. And if he’s going for a post-doc they likely won’t need him immediately, so he can take his time relocating. Thanks for your insight into the postdoc-obtaining timeline. You are right that I am being overly optimistic. We were told to start looking for postdocs 6-9 months in advance of when you want to start. Your argument definitely sways me toward the 1 BR places. Now that we know that his PI can keep him on after he graduates maybe he can secure a postdoc but extend the transition period, like you said, to stay here with me as long as possible. I’ve always loved looking through floor plans too! That line graph really lays it all out for you. It seems like the smart financial call is just the 2 bdrm. You can hedge your bets and know what you’re going to pay. I’ve never lived in anything larger than a 2 bdrm, but looking back on college I should have lived in a 4 bdrm. As the number of people goes up, your value also goes up, and that’s definitely the most important when you’re in college. If I were single I would want to live with lots of people. Durham has a brothel law, though, so there are no 4 BR apartments and 3 BR ones are rare. My friends who live with 4 people in a house have to leave 1 off the lease! Yeah, the 2 BR is the best call… Ugh, I just find it boring. I’ve lived in 2 BR places for 5 years now. I have several friends who have gotten their PHd’s and I can’t imagine you wanting a roomie other than Kyle. It seems like a lot of hassle at a time when you really want to avoid hassle. Also, the rent seems pretty affordable for a one bedroom. If you still decided to go the roommate route I would go with the 2 bedroom because that is one person fewer that you would have to deal with. Also, diving the rent and utilities is a lot easier. I’ve lived in places with more than one roommate-eventually, there will be a problem. Noise, money, boyfriends/girlfriends coming over, someone eating your food, cleaning issues, and I could list a number of other potential issues. I live by myself and I LOVE it. If I get lonely I just do something fun. Good luck with this! I guess I’ve gotten pretty lucky with roommates because I haven’t had any major or persistent problems. I agree that it would be easier to live by myself after Kyle graduates, but I also think it would be lonely! I guess it just comes down to that I don’t want to live by myself. I don’t need to be BFFs with roommates but I think it’s nice to have someone to say hi to occasionally! I read these posts out of order so I know you’ve already settled on a place, but I bet the analysis you did here worked towards a quick decision! I think it’s funny that we ended up in the place I used to do this analysis! I really thought we were going to go for another townhouse for rent by owner or an apartment in a complex. you should brush up on the tenacies act. in a nut shell, yes they have to give you 60 days clear notice (that is, now that we’re into august, you could stay until the end of october) – that’s the minimum. BUT they need to file the proper paperwork with you (email isn’t) – i think its a form NR60 intent to occupy the premise for personal use. Also, just because your lease ends, doens’t mean its terminated – you’re onto an automatic month to month renewal unless you and the landlord agree to other terms….. Thanks for your comment. In our case, whatever the specifics of the legalities may be, even if we could delay having to leave for a month or two it doesn’t change the ultimate result that we have to move. It’s better for us to move earlier rather than later because the window on the high-turnover season was closing. Plus we’re lowering our rent so why wait?